Robin Salvo, left, director of the Black Wing Shooting Center, 3722 Marysville Road, Delaware, helps Danielle Creske, right, pick out a suitable handgun that fits the type of shooting she might do in the future. The annual “Ohio’s Law on Concealed Handguns” report, which was issued on March 1 by Ohio Attorney General Dave Yost, shows a 10 percent decrease in the number of new concealed-carry licenses issued statewide in 2018. However, there was an 83 percent increase in renewal licenses issued last year. The report shows a total of 168,302 concealed-carry licenses were issued to state residents in 2018: 98,927 renewals and 69,375 new licenses. In addition, 1,436 licenses were denied statewide in 2018, up from 1,216 denials in 2017. “Ohio county sheriffs began issuing concealed-carry licenses in 2004, and permit holders who wish to renew their licenses must do so every five years,” the report states. Under Ohio Revised Code Section 109.731(C), the responsibility of issuing, suspending or denying the license comes under the jurisdiction of the Ohio county sheriffs. Each quarter numbers are reported to the Ohio Peace Officer Training Commission, a section of the Ohio Attorney General’s Office. According to Tracy Whited, Delaware County Sheriff’s Office public information officer, the total number of licenses issued in the county in 2018 was 2,659. She said the DCSO issued 963 new licenses and 1,696 renewals — a 29 percent increase over 2017. Whited added there were 2,057 licenses issued in 2017 — a 23 percent increase over 2016. 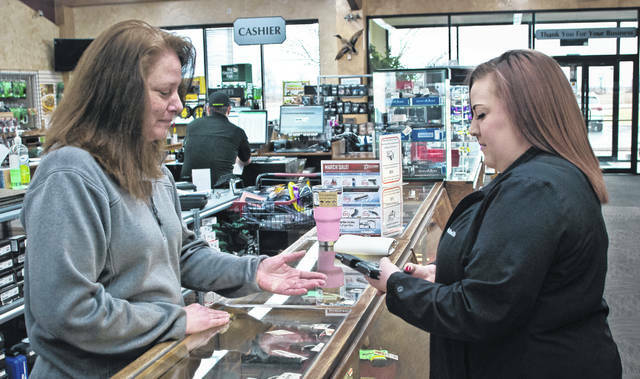 “According to our conceal handgun license specialists, as of March 1, we are already ahead of the number issued at this same time last year,” she said. The attorney general’s report shows that Delaware County denied issuing two concealed-carry licenses in 2018. The Black Wing Shooting Center, 3722 Marysville Road, Delaware, offers concealed-carry classes four to five times a month. According to Robin Salvo, director, she hasn’t seen much of an increase in the number of new licenses. Salvo said the shooting center is seeing a lot of first-time shooters. Salvo said people think it always happens to the other guy. Salvo said she tracks sales on a quarterly basis. To learn more about Ohio’s concealed carry laws or to view this year’s report and other statistics, visit www.OhioAttorneyGeneral.gov/ConcealedCarry. This entry was tagged Black Wing Shooting Center, Conceal Carry, D. Anthony Botkin, delaware county, Ohio Attorney General Dave Yost, Robin Salvo, Tracy Whited. Bookmark the permalink.